In July 2017 I began at the Museum as a curator working as part of a team on new gallery about Australia’s environmental history and was tasked with researching the thylacine and Tasmanian wilderness. I couldn’t have been happier, having been obsessed with thylacines as a child. I once asked my parents for a pet thylacine for Christmas! So it was with great excitement, and some scepticism, that I took on the task of investigating this thylacine pelt when it was offered to the National Museum. In July 2018 conservator Natalie Ison and I visited the pelt in Launceston where it had been brought for conservation treatment, scientific study and preparation for sale. We were surprised and saddened by the small size, showing this thylacine was probably a young adult when she died. The flaps of skin near her hindquarters are thought to be the remnants of a pouch. It was a memorable and affecting moment and we learned a great deal about her immediately. Curator Karen Schamberger (left) and conservator Prue Castles with the thylacine pelt. The fur is soft and the colour is strong, not faded. The pelt is almost complete, with foot bones and associated tissue. These will likely provide potential for osteological and genomic analysis as well as providing potential information for aspects of thylacine natural history such as behaviour, hunting and extinction. The pelt also shows evidence of the tanning process with a nail in the front left paw and tiny tack holes along the sides. It is in better condition than the other 79 known pelts because it was stored in darkness or low light. So how did this thylacine get here? We know that Archibald Campbell Robertson acquired this thylacine on a voyage to Sydney in 1923 and brought it and other Australian specimens to his home in Papaiti, Whanganui, New Zealand. Robertson was a collector of ethnographic and natural history specimens and was skilled in taxidermy. Robertson’s daughter, Janet Withers, inherited the ethnographic collection on her father’s death in 1970. From the 1980s, her children opened the Robertson house to the public, until it was sold in 1999. The pelt was then discovered in a drawer and lent with the collection of taxidermied birds to John McCosh for display at his taxidermy and canoe hire business, the Kahutara Taxidermy Gallery. Neither the family nor McCosh knew what animal the pelt came from. 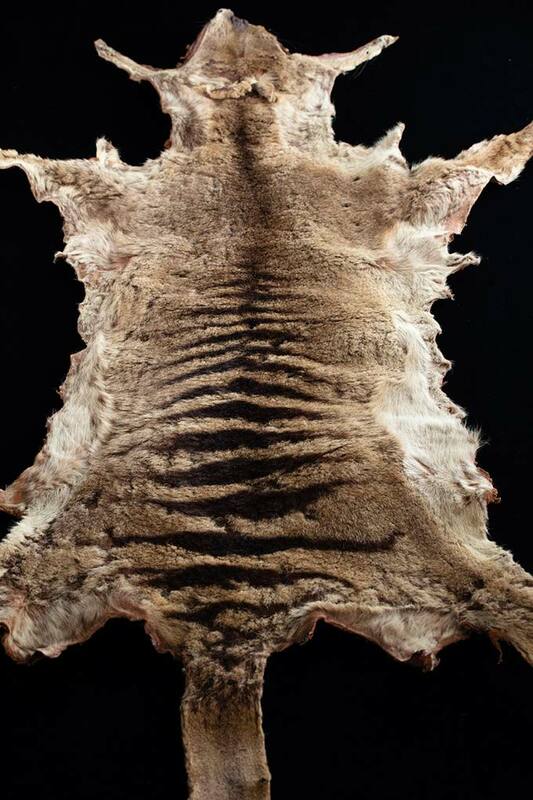 It took the interest and care of many people to authenticate the pelt and enable its journey to the National Museum in Canberra. 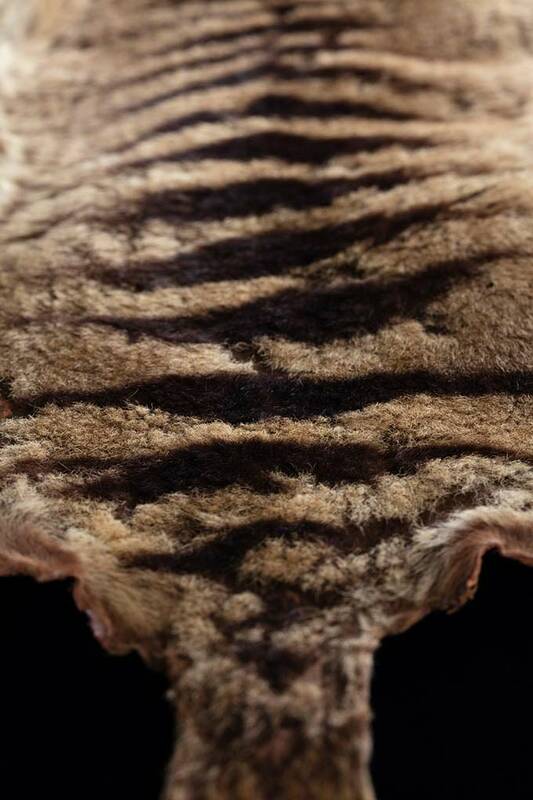 Rumours, including a Twitter image, of a previously undocumented pelt were circulating in New Zealand. In September 2017, Alan Tennyson, Curator of Vertebrates at the Museum of New Zealand Te Papa Tongarewa asked Stephen Sleightholme, Project Director of the International Thylacine Specimen Database, to investigate rumours of a pelt in South Wairarapa. Sleightholme contacted McCosh, and then Withers, to authenticate and catalogue the pelt for the database. 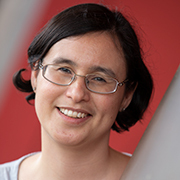 Sleightholme also sought the conservation advice of Tammy Gordon of the Queen Victoria Museum and Art Gallery in Launceston. Sleighthome also contacted David Thurrowgood, a Tasmanian-based conservator, and he imported the pelt to Australia for treatment and sale in 2018. While in Thurrowgood’s care, Gordon also formally authenticated the pelt. After commissioning three independent valuations, the National Museum paid $250,000 for the pelt, with $125,000 coming from the National Cultural Heritage Account, which enables cultural institutions to purchase nationally significant objects. 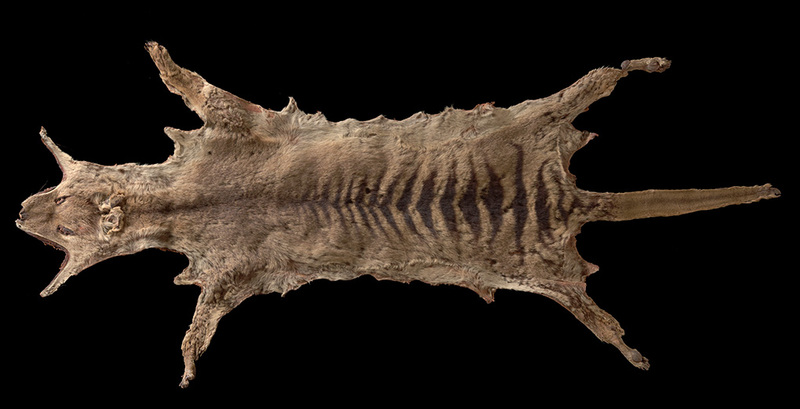 This pelt joins an internationally significant thylacine collection at the National Museum. It will be on display in our Landmarks gallery from 14 February until mid-May 2019. This item was purchased with the support of the Australian Government through the National Cultural Heritage Account.